Home SEND Local Offer How goes the development of the Local Offer? How goes the development of the Local Offer? How goes the Local Offer? Do you really, really want to know? At the end of last week three reports came out about the SEN reform Pathfinder project. One was about workforce development, one about 19-25 years provision and one about the development of the Local Offer. The Pathfinder, if you didn't know, is the trialling of various aspects of the reforms involving a number of local authorities. The latest report about the Local Offer involved both Pathfinder and non-Pathfinder LAs. For those who don't know what the Local Offer is supposed to be, it is a directory (oh, yes it is) always kept up-to-date, of all the services in the area and close cross-border, that can be accessed by families who have a child with SEN or a disability. The Department for Education has always insisted it isn't to be called a "directory", but if it looks like a directory and functions like a directory then I'm sorry, but it's a flaming directory. What they actually meant was it's a "directory plus" because it is supposed to be more than a searchable point of information that is comprehensive, easy to access and to navigate. It is also designed to allow families to give feedback on the services they find and enable the local authority to highlight gaps in services. Presumably this is so they can plug the identified gap, but with the massive cuts in services that most LAs are facing, knowing there's a gap is about as far as it may go. 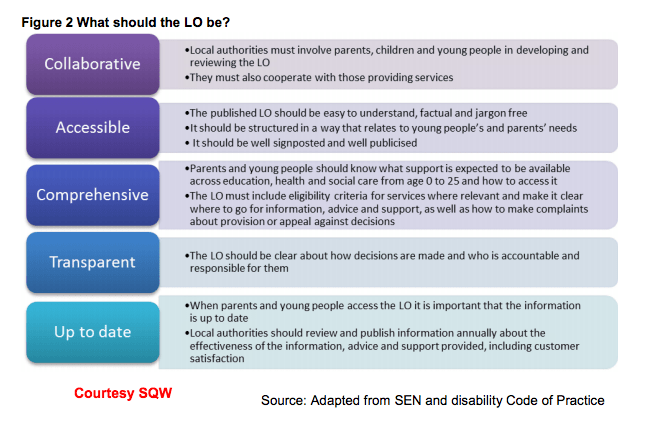 The SEND Code of Practice 2014 sets out what it expects the Local Offer to embody and the diagram below is from this report by SQW, the reform evaluators. The report has concluded that Local Offers remain, three months in, a work in progress and will "need to continue to evolve and be updated over time in order to meet both central government and local aspirations." An understatement if ever there was one. If you are one of the first families to go through a transfer to an EHCP (as we are), or a new entrant, you might as well forget there is such a thing as the Local Offer because it's likely to be as full of holes as a premium Swiss cheese. Of course it's a massive and moveable task, to gather all the information to populate the database with every service for disabled children in the area. It's going to take time and persistence to complete it and keep it updated. It's the digital equivalent of the Forth bridge. A large part of the problem with the development of the LO is, in my opinion, that although everyone knew the reforms were on their way, few seemed to quite believe it until the Children & Families Act actually became law. So unless your LA was a Pathfinder (trial authority), the chances are it hadn't given how to create a Local Offer much serious consideration. Added to this, there hasn't been any early, definitive guidance on how to go about it such as a "1. then 2. then 3.". As a result, local authorities have proceeded in different ways, some using their own technical team and others hiring in an external IT company. I'm not sure how many have had User Experience (UX) specialists on board although parents and young people - ie users - were mandated to be centrally involved in its development. The report found a very patchy picture. Of the areas whose Local Offer websites were evaluated, there was a very variable level of 'user-friendliness'. This appeared to be as a result of the amount of money invested, the level of IT expertise available, the restrictiveness of LA communications/IT regulations regarding visual design and the quality of information collected. It seems that local authorities looked at the guidelines and then made the rest up as they went along - for what else were they supposed to do (apart from learn from the Pathfinder experiences)? The guidelines (in the diagram above) were not detailed or prescriptive. This was intentional by the DfE as every area is different and a one-size-fits-all approach wouldn't work, so they were supposed to meld the principles to their own unique area characteristics. Indeed, the creation of such a comprehensive resource is an opportunity to create something incredibly useful that can be the area's "go-to" site for families with disabled children. But, I think, what has happened in some places is that LA politics have got in the way. Decisions made over how much money was invested, whether it fitted the LA 'corporate' design or had an individual feel, whether to use the in-house digital team or contract the IT externally (and then to whom) will all have had an impact to some extent on the delivery of a usable website. That's before you even look at the content in a situation where time is not on their side. Those decisions are unlikely to have been made with the benefit of the project in mind, but to serve policies, budgets and personalities and they will most probably have caused delays to even getting the project underway. Another issue that SQW looked at was the sustainability question. The report found that, "Limited progress has been made across most areas in terms of planning for the sustainability of the LOs, including how they will be kept up to date and how family comments will be published and actioned. However, all areas acknowledged that maintenance of the LO would require resource and so consideration of how to sustain their LO should be a priority, particularly in areas where the LO team will be disbanded following September 2014." Yes, that's right - some areas are giving their Local Offer teams the chop before the sites are sustainable! And, it seems, insufficient thought or planning has been given to funding one of the key principles of the LO - being kept up to date. You can't keep it up to date without anyone there to do the work or any money to pay them or fund the website maintenance. Ensuring the LOs remain up to date is crucial in order for them to be useful (and used) by parents, children and young people and professionals. The process for reviewing and updating content has not been given extensive consideration by most case study areas to date, with areas focusing upon getting LOs published first. However, maintaining and updating the LO was expected to require a level of continued resourcing; whether through the continuation of a designated LO officer role, building it into existing job descriptions or funding its maintenance through an outside provider... ....The resourcing arrangements should also be carefully considered and planned for, to ensure LOs don’t become out of date, and consequently obsolete. A primary issue of such a site, when it is to be used by young people with disabilities and families who may not have a computer or smartphone to hand, is accessibility. The report identified the possibility of developing a paper copy, but can you imagine the size of it? You'd need a wheelbarrow to move it around! And it would become incredibly expensive keeping it current. A second route was suggested, creating a helpline or guide role such as a variety of people who could act as go-betweens such as social workers, voluntary organisations and information officers to provide the information needed. Again, this has funding implications as well as the capacity of individuals to fulfil this role. In our local authority, a network of information 'Hubs' has been developed to give anyone who needs it, access to local service information. Utilising these hubs as a Local Offer access point is an excellent idea, provided a family can actually get there, of course. It may just end up cheaper to give every family in need an android tablet and free internet connection! Before families can use the Local Offer, they have to know it actually exists and this is yet again a work in progress. As hard as it is to believe, not every SEND parent reads SNJ (unbelievable, I know!) so they will be relying on the local authority, schools, colleges and support organisations to tell them about it. Indeed, awareness raising amongst professionals was felt to be key to facilitating wider usage amongst parents. Yes it's true, a good percentage of professionals, who work for the local authority, don't know about the Local Offer either. I now have to end this post so I can *face palm* myself for the rest of the evening. Last month we went to a SEND conference about the local offer. It was a presentation about the EHC Plan. Totally irrelevant information – the history of the Children and Families Act… but unable to answer questions we want answered: when parents could appeal and the time frame. On top of that, and what was most disturbing, was none of the parents outside the local parents’ group who supposedly ‘co-produced’ it… had never heard of the Local Offer, some hadn’t heard of the transfer to the EHC plan and the C&F Act. Most of the parents didn’t even know about the council’s directory of services. Our advice had been largely ignored and the mood in the room was angry, to say the least. The LA had been congratulating themselves on a good job – they got a wake up call that day. Still waiting for them to inform us what is happening… An absolute shambles – they don’t know what they are doing. Yes, it seems that communication information is something that is always left as an afterthought. It’s not like LA SEN depts and schools don’t know how to find the parents- they have them on their SEN registers. The problem is a systemic one and one of buy-in, the latter of which takes time. And the government wanted it in before the election. So at its root, it’s all down to politics, not what’s good for families. So the theory is there – what happens when you actually try and access any of the services is anyone’s guess. As the report points out, what it will become ‘over time’ depends entirely on the funding allocated to maintain and grow it- the sustainability issue. Our local offer is published and out there, it summarises what it does and doesn’t do, however this is only theoretical and long suffering families in our area already know this is an ideal model. Also quite a lot of the things listed or described are very very obviously copy and paste, they do not reflect the local services on offer. Furthermore if they are in the background beavering away to orchestrate transferring everyone over to the EHCP it doesn’t appear to be that obvious and most in our area are very wary. The LA have already stepped up how they will tackle and pre-empt tribunals, yes we are in one of those LAs, to make it extremely hard for parents to attempt to fight for legal obligations. Watching and waiting with interest. We have a parent group in our area, unelected unvoted in body of slef elected uber parents working closely, far too closely with the weasels in the LA and claiming they represent us all, they most certainly don’t. Claiming to get our voices out there, by whose jurisdiction I wonder. I’m sticking with IPSEA and SEN J advice. Too many assumptions made people have access to this that and the other resources and the time or energy to follow every change and nuance, this process weighted in favour of certain socio economic groups more than others. The local charity, no one had ever heard of, crawled out from under a stone, awarded the ‘Independent’ Advisors role has two people and one volunteer, where are they anyway? What else can we do? It’s clearly not the same in all LAs, the most pivotal person in the middle of all this, the young person(s) with disability or SEN. Lots of tokenism but little else of substance at present behind the current rhetoric.